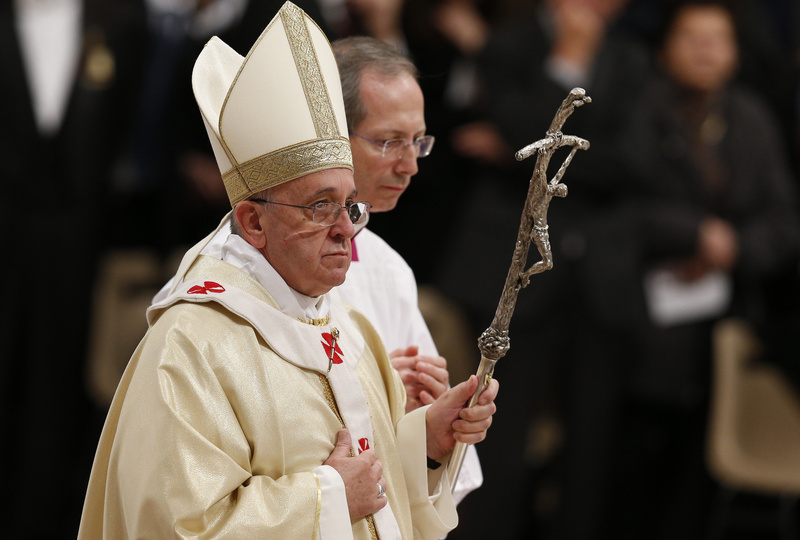 Why does so much of Pope Francis' speech seem to be haunted by the Devil? "For Francis, the Devil is not a myth, but a real person," explains Father Thomas Rosica, C.S.B., of Salt and Light TV, in a new video that is part of The Living Word collaboration between America and the American Bible Society. "I believe that the Devil exists" and "his greatest achievement in these times has been to make us believe that he doesn't exist," then-Cardinal Bergoglio said in the 2010 book, "On Heaven and Earth, a theme informed by his Jesuit spirituality that Francis continues to revisit in speeches and homilies. Division within a Christian community is a very grave sin; it is the work of the devil. "Largely under the radar, theologians and Vatican insiders say, Francis has not only dwelled far more on Satan in sermons and speeches than his recent predecessors have, but also sought to rekindle the Devil’s image as a supernatural entity with the forces­ of evil at his beck and call." Even in what some might see as innocuous subjects, Francis sees the influence of evil: "Let's look at gossip," says Rosica, paraphrasing Francis. "I'm a bit envious of this or that person at first I'm just envious inside. But I need to share it and go to another person and say 'have you seen this person?' and this gossip tries to grow and infects another. This is the way gossip works and all of us have been tempted to gossip. It's a daily temptation. It begins in this way discreetly like a little trickle of water. It grows by infecting others and in the end it justifies itself." "Each time he speaks about the Devil, Pope Francis urges us to be vigilant and not to give into that initial temptation and thus allow it to spread" Rosica adds. "There's also a Jesuit connection to the Devil for Pope Francis," Rosica says. "You see, in Ignatius' teaching, there is an edginess, a seriousness about the campaign the opposition of the evil one, and about the strength and grace that people need to make us resist and to make the right decision. For Ignatius and for Pope Francis, people must discern where God is calling them and following that call requires courage and a willingness to accept suffering and rejection. St Ignatius believed that making progress in following Christ gives birth to a sense of peace and harmony even in the face of challenges. The enemy doesn't like that and tries to disrupt it, particularly by tempting Christians to focus all their attention on themselves." Read Francis in his own words on Satan in the 21st century, resisting evil by a daily examination of conscience, and his belief that the Devil wants to destroy the family. The history (a long long history) of evil, temptations and creation of a human like ness and image for what is bad and ugly in mans journey, bad angels, God creating or asking his dearest, most loved and closest archangel (SAMUEL) to be his advocate and temptress of His man that He (God) created in his own image and likeness. Way before the Jewish history mankind created and personified what is bad, troublesome, tempting and evil a outside accuser and advisory thing or person (Satan , Lucifer, devil to explain off what mankind did and or acted that hurt others or rulers). Jesus speaks of those never knowing of His ways, and that they are lost, additionally he compares this place of isolation as liken to places where mankind goes where no other wants to be, and no one comes back: but nowhere in his rhetoric does he directly say there is a place where mankind is condemned to everlasting fire and brimstone, what people to day see as Hell a place where risen man burns forever. So in speaking of Hell and Evil, there is a whole massive understanding that needs to come to light taking in the complete picture of evil, temptation, advocacy and mans reality of the teachings of history and especially as Christians that of what is know from Jesus, kind of like "Get behind me Satan" as Jesus spoke to St. Peter. I have no authoritative answer about the "devil," of course, but the Biblical scholar, Elaine Pagels, wrote an excellent book on the topic some years ago, The Origin of Satan. I.e., the IDEA of Satan. From my perspective, Jesus' temptation in the desert, as one human example, had nothing to do with a foreign being but instead involved his own very human struggles against the ego aspect of his mind in choosing to follow the true, Spirit, aspect of his mind. Every human being is familiar with this very human struggle. Conjuring up an image of a malevolent creature, in my opinion, needlessly adds another level of fear to the issue - and the world needs more compassion and less fear, in my opinion. "Perfect love casts out fear," as the author of I John wrote long ago. How did Mark and Luke know the story of Christ's temptation? If Mark's gospel is the preaching of Peter and Luke's gospel is the story from Mary, then the temptation story was told to them by the only person who would know what happened in the desert--Christ. Si it's really not what you think or what Elaine Pagels thinks happened, it's about what Christ told his apostles and his mother about what happened. If Christ said the devil said, he said--that does not indicate how one wrestles with one's own thoughts. It indicates someone else speaking. A person. Since we know archangels are persons, and Lucifer was an archangel, why are we doubting that Satan is a person? Do we doubt that Gabriel, Raphael and St. Michael the archangel are persons too? Do we doubt that the Holy spirit is a person? Must we cast aside common sense and deductive logic to accept the theories of experts? Truth conquers fear. God is truth.